As the results of the stress test start leaking out slowly, it’s a fun exercise to make some educated guesses/predictions about what the future holds and take note of pertinent facts. As we’ve discussed before, there is a lot to take issue with when considering the results of the stress test at all, especially given the added layers of uncertainty stemming form the limited information provided in the scenarios. So, without further delay, let’s get started. (6) Under the baseline scenario, BHCs were instructed to assume no further losses beyond current marks. New FASB guidance on fair value measurements and impairments was issued on April 9, 2009, after the commencement of the [stress test]. For the baseline scenario supervisors considered firms’ resubmissions that incorporated the new guidance. Losses in the trading portfolio were evaluated by applying market stress factors … based on the actual market movements that occurred over the stress horizon (June 30 to December 31, 2008). Well, looks like a big move is taken into account by using this time horizon. Clearly this should provide a reasonable benchmark for the stress test results, right? Well, maybe not. Yes, that’s right, we’ve undergone, for sub-prime securities a massive widening during 2009 already. Also, as far as I can tell, the tests are being run starting from the December 2008 balance sheet for each company. So, if I’m correct, for the harsher scenario, trading losses will be taken on December 2008 trading positions using December 2008 prices and applying June 2008 to December 2008 market movements. For sub-prime, it seems pretty clear that most securities would be written up (June 2008 Spread: ~200, December 2008 Spread: ~1000, Delta: ~800, Current Spread: ~2600, December 2008 to Today Delta: ~1600, Result: firms would take, from December 2008 levels, half the markdown they have already taken). Also, it should be a shock to absolutely no one that most trading assets will undergo a lagged version of this same decline. Commercial mortgages and corporate securities rely on how firms actually perform. Consumer-facing firms, as unemployment rises, the economy worsens and consumption declines, and consumers default, will see a lagged deterioration that will appear in corporate defaults and small businesses shuttering–both of these will lead to commercial mortgages souring. Indeed we’ve seen Moody’s benchmark report on commercial real estate register a massive deterioration in fundamentals. That doesn’t even take into account large, exogenous events in the sector. Likewise, we see consistently dire predictions in corporate credit research reports that only point to rising defaults 2009 and 2010. Mr. Alphin noted that the $34 billion figure is well below the $45 billion in capital that the government has already allocated to the bank, although he said the bank has plenty of options to raise the capital on its own. Right around the time you read the first bolded statement, you should have started to become dizzy and pass out. When you came to, you saw that the chief administrative officer, who I doubt was supposed to speak on this matter (especially in advance of the actual results), saying that a bank with $69 billion in capital would be refunding $11 billion of the $45 billion in capital it has already received because they only need $34 billion in capital total. Huh? Nevermind that the Times should have caught this odd discrepancy, but if this is the P.R. face the bank wants to put on, they are screwed. Now, trying to deal with what little substance there is in the article, along with the FT piece, it seems pretty clear that, if Bank of America needs $34 billion in additional capital, there is no way to get it without converting preferred shares to common shares. There is mention of raising $8 billion from a sale of a stake in the China Construction Bank (why are they selling things if they are net positive $11 billion, I don’t know). That leaves $26 billion. Well, I’m glad that “once a normal environment returns” Bank of America can generate $30 billion in income (Does all of that fall to T.C.E.? I doubt it, but I have no idea). However, over the past four quarters, Bank of America has added just $17 billion in capital… I will remind everyone that this timeframe spans both T.A.R.P. and an additional $45 billion in capital being injected into the flailing bank. Also, who is going to buy into a Bank of America equity offering now? Especially $26 billion of equity! If a troubled bank can raise this amount of equity in the current environment, then the credit crisis is over! Rejoice! 3. Banks will be stuck, unable to lend, for a long time. I owe John Hempton for this insight. In short, originations require capital. Capital, as we see, is in short supply and needed to cover losses for the foreseeable future. Hence, with a huge pipeline of losses developing and banks already in need of capital, there is likely not going to be any other lending going on for a while. This means banks’ ability to generate more revenue/earnings is going to be severely handicapped as sour loans make up a larger and larger percentage of their portfolios. 4. From what I’ve read, it seems that the actual Citi number, for capital to be raised, is between $6 billion and $10 billion. This puts their capital needs at $15 billion to $19 billion, since they are selling assets to raise around $9 billion, which is counted when considering the amount of capital that needs to be raised (according to various news stories). Interestingly, this is 44% to 55% of Bank of America’s needed capital. This paints a very different picture of the relative health of these two firms than the “common wisdom” does. Granted, this includes a partial conversion of Citi’s preferred equity to common equity. 5. I see a huge correlation between under-performing portfolios and a bank trying to negotiate it’s required capital lower by “appealing” the stress test’s assessment of likely losses in both the baseline and adverse scenarios. As I’ve talked about before, not all portfolio performance is created equal. Citi has seen an increasing (and accelerating) trend in delinquencies while JP Morgan has seen it’s portfolio stabilize. So, for the less-healthy banks to argue their losses are overstated by regulators, they are doubly wrong. It’ll be interesting to see how this plays out–for example, if JP Morgan’s credit card portfolio assumes better or worse performance than Citi and Bank of America. Hey, I wanted to let you, my loyal readers, know that I guest posted over at Clusterstock. The post, entitled “Investment Bank Scorecard” is my take on this past quarter as a whole. I think it’s worth clicking over and taking a look. I’d sum it up here, but, in all honesty, the value is in the nuances and small insights more than the general thesis. Also, here is the chart attached to that post, in its orginal form. These numbers should bother Citi shareholders. Ignoring the 1Q08 numbers, Citi–whose global business is much larger and much more diverse than it’s rivals–generates no more, if not slightly less, revenue than the domestically focused JP Morgan and much, much less than Goldman. But it gets worse. Goldman’s balance sheet was $925 billion vs. Citi’s $1.06 trillion in assets within it’s investment banking businesses, roughly 10% larger. I’d compare JP Morgan, but they provide a shamefully small amount of information. As an entire franchise, however, Citi was able to generate their headline number: $24.8 billion in revenue, on assets of $1.822 trillion. JP Morgan, as a whole, was able to generate $26.9 billion, on assets of $2.079 trillion. JP Morgan, then is 14% larger, by assets, and generstes 8% higher revenue. These numbers should be disconcerting to Citi, it’s no better at revenue generation than it’s rivals, despite having a larger business in higher growth, higher margin markets. Further, in an environment rife with opportunity (Goldman’s results support this view, and anecdotal support is strong), Citi was totally unable to leverage any aspect of it’s business to get standout results… and we’re only talking about revenue! Forget it’s cost issues, impairments and other charges as it disposes assets, etc. On The Magical Disappearing Writedowns: Even more amazing is the lack of writedowns. However, this isn’t because there aren’t any. JP Morgan had writedowns of, approximately, $900 million (hard to tell, because they disclose little in the way of details). Goldman had approximately $2 billion in writedowns (half from mortgages). Citi topped these with $3.5 billion in writedowns on sub-prime alone (although they claim only $2.2 billion in writedowns, which seems inconsistent). But, that isn’t close to the whole story. Last quarter, in what I could find almost no commentary on during the last conference call and almost nothing written about in filings or press releases, Citi moved $64 billion in assets from the “Available-for-sale and non-marketable equity securities” line item to the “Held-to-maturity” line item. In fact, $10.6 billion of the $12.5 billion in Alt-A mortgage exposure is in these, non–mark-to-market accounts. There was only $500 million in writedowns on this entire portfolio, surprise! Oh, and the non–mark-to-market accounts carry prices that are 11 points higher (58% of face versus 47% of face). What other crap is hiding from the light? $16.1 billion out of $16.2 billion total in S.I.V. exposure, $5.6 billion out of $8.5 billion total in Auction Rate Securities exposure, $8.4 billion out of $9.5 billion total in “Highly Leveraged Finance Commitments,” and, seemingly, $25.8 billion out of $36.1 billion in commercial real estate (hard to tell because their numbers aren’t clear), are all sitting in accounts that are no longer subject to writedowns based on fluctuations in market value, unlike their competitors. These are mostly assets managed off the trading desk, but marked according to different rules than traded assets. If one doesn’t have to mark their assets, then having no writedowns makes sense. On The Not-so-friendly Trend: This is a situation where, I believe, the graphs speak for themselves. Do any of these graphs look like things have turned the corner? Honestly, these numbers don’t even look like they are decelerating! Compare this with the (relatively few) graphs provided by JP Morgan. These aren’t directly comparable, as the categories don’t correspond to one another, and JP Morgan uses the more conservative 30-day delinquent instead of Citi’s 90+-day delinquent numbers. However, JP Morgan’s portfolio’s performance seems to be leveling out and even improving (with the possible exception of “Prime Mortgages”). Clearly, the pictures being painted of the future are very different for these institutions. Slide five is a chart similar to one that we showed last quarter which shows the movement in corporate credit spreads since the end of 2007. During the quarter our bond spreads widened and we recorded $180 million net gain on the value of our own debt for which we’ve elected the fair value option. On our non-monoline derivative positions counterparty CDS spreads actually narrowed slightly which created a small gain on a derivative asset positions. 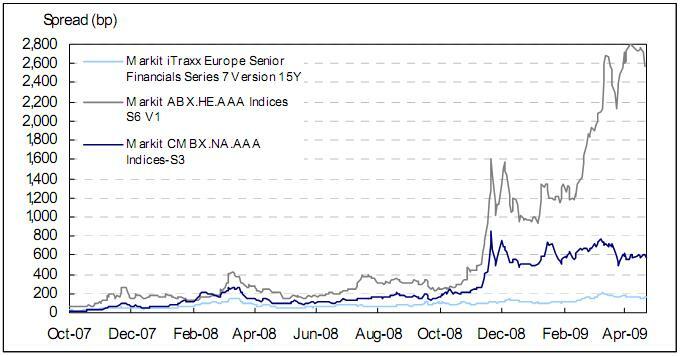 Our own CDS spreads widened significantly which created substantial gain on our derivative liability positions. This resulted in a $2.7 billion net mark to market gain. We’ve shown on the slide the five-year bond spreads for illustrative purposes. CVA on our own fair value debt is calculated by weighting the spread movements of the various bond tenors corresponding to the average tenors of debt maturities in our debt portfolio. The debt portfolio for which we’ve elected the fair value options is more heavily weighted towards shorter tenures. SFAS 157 requires that Citi’s own credit risk be considered in determining the market value of any Citi liability carried at fair value. These liabilities include derivative instruments as well as debt and other liabilities for which the fair-value option was elected. The credit valuation adjustment (CVA) is recognized on the balance sheet as a reduction in the associated liability to arrive at the fair value (carrying value) of the liability. Citi has historically used its credit spreads observed in the credit default swap (CDS) market to estimate the market value of these liabilities. 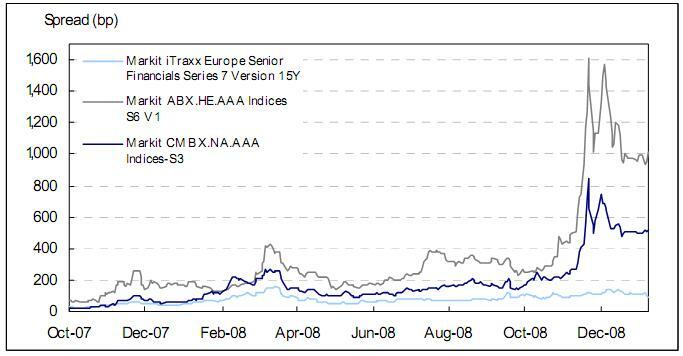 Beginning in September 2008, Citi’s CDS spread and credit spreads observed in the bond market (cash spreads) diverged from each other and from their historical relationship. For example, the three-year CDS spread narrowed from 315 basis points (bps) on September 30, 2008, to 202 bps on December 31, 2008, while the three-year cash spread widened from 430 bps to 490 bps over the same time period. Due to the persistence and significance of this divergence during the fourth quarter, management determined that such a pattern may not be temporary and that using cash spreads would be more relevant to the valuation of debt instruments (whether issued as liabilities or purchased as assets). Therefore, Citi changed its method of estimating the market value of liabilities for which the fair-value option was elected to incorporate Citi’s cash spreads. (CDS spreads continue to be used to calculate the CVA for derivative positions, as described on page 92.) This change in estimation methodology resulted in a $2.5 billion pretax gain recognized in earnings in the fourth quarter of 2008. The CVA recognized on fair-value option debt instruments was $5,446 million and $888 million as of December 31, 2008 and 2007, respectively. The pretax gain recognized due to changes in the CVA balance was $4,558 million and $888 million for 2008 and 2007, respectively. The table below summarizes the CVA for fair-value option debt instruments, determined under each methodology as of December 31, 2008 and 2007, and the pretax gain that would have been recognized in the year then ended had each methodology been used consistently during 2008 and 2007 (in millions of dollars). Got all that? So, Citi, in it’s infinite wisdom, decided to change methodologies and monetize, immediately, an additional 290 bps in widening on it’s own debt. This change saw an increase in earnings of $2.5 billion prior to this quarter. In fact, Citi saw a total of $4.5 billion in earnings from this trick in 2008. However, this widening in debt spreads was a calendar year 2008 phenomenon, and CDS lagged, hence the out-sized gain this quarter in derivatives due to FAS 157 versus debt. Amazing. And, while we’re here, I want to dispel a myth. This accounting trick has nothing to do with reality. The claim has always been that a firm could purchase it’s debt securities at a discount and profit from that under the accounting rules, so this was a form of mark-to-market. Well, unfortunately, rating agencies view that as a technical default–S&P even has a credit rating (“SD” for selective default) for this situation. This raises your cost of borrowing (what’s to say I’ll get paid in full on future debt?) and has large credit implications. I’m very, very sure that lots of legal documents refer to collateral posting, and other negative effects if Citi is deemed in “default” by a rating agency, and this would be a form of default. This is a trick, plain and simple–in reality, distressed tender offers would cost a firm money. The Bottom Line: Citi isn’t out of the woods. In this recent earnings report I see a lot of reasons to both worry and remain pessimistic about Citi in the near- and medium-term. If you disagree, drop me a line… I’m curious to hear from Citi defenders. How to Fix the Compensation Issue… Yesterday! With all the tone-deafness that followed the great compensation debate of 2009, I have a very simple solution. The problem, despite what people commonly believe, is not the absolute level of compensation. No, it’s the fact that management’s personal incentives and employees’ incentives are aligned–shareholders are still in the wilderness. How many times have we heard the trite, absolutely silly refrain stating “we need to pay the valuable people that know where the bodies are buried so they can dispose of them!”? Way too many. Although, there are dozens of examples of retention bonuses being paid to people as they resign… Idiots. So, what do I suggest? Add all compensation, beyond a base limit, say $250,000, as T.A.R.P. debt to institutions who have already received funds under the program–and the interest rate from this new debt should be very high. I would suggest… okay, I never merely suggest… I would demand (better!) that this new debt carry a high coupon. Maybe even ensure the interest owed is cutely linked to the way these publicly owned (partially, anyway) institutions are negatively impacting our economy. One example: this new debt could carry an interest rate equal to the greater of the (a) median of the top quartile of credit card interest rates issued by the company in question and (b) 24.99%. Now, what does this do? It better aligns management and shareholders. How can a C.E.O. allow divisions that lost billions to run up it’s debt? And, how can an institution award these bonuses necessary to pay people, right out of taxpayer money, if they aren’t willing to pay it back later? By definition, every dollar that flows into the pockets of employees can’t go back to the taxpayers whose money saved these same institutions. Once managers need to actually justify why they are paying people, due to the higher cost, I guarantee fewer employees will receive these higher bonuses. Gone will be the cuspy performers who are being paid because Wall St. is a creature of habit. This will create a wholesale re-thinking of compensation at many institutions. And, honestly, it’s long overdue. To be honest, I don’t really view this higher cost as excessive, either. People being paid 8-12% of profits (it’s actually revenue traders are compensated on, but don’t tell anyone that) should wind up actually costing 10%-20% of profits with this excess debt, perhaps as high as 30%–but these employees continue to be employed and able to profit due to taxpayer funds to begin with. It’s time managers are required justify, to their boards and owners, why high compensation for various employees is necessary. And, since companies say a surtax or banning of bonuses is bad and bonuses are absolutely required, they should be more than willing to pay these higher rates–they need these people after all! This is just a few quick thoughts, but I believe, in a few years, we’ll be able to take this bill and place it’s effects high on the list of unintended consequences. Let’s wonder what a reasonable firm would do in order to protect it’s people as much as possible from this legislation… I would put forth the proposal that a firm would give it’s employees the most “bang for the buck.” This seems to clearly be by paying in options. Now, I don’t know all the technical details behind how finance companies have to account for and value options given as compensation, but, using the CBOE option pricer and volatility from Morningstar, I get around $0.50 as the option price for a strike of $2.50 at the time Citi was giving bonuses out, around the time it was at $1.00. Or, if we use $2.50 for the equity price and the strike price, we get $1.62 option price. Since those prices are per share for lots of 100 option, we get anywhere between 500,000 and 155,000 options, depending on when Citi’s rules would require it to re-cast it’s payments to employees. That’s obviously a huge range. However, for some context, when Citi was trading at $50 / share, having 500,000 shares would have meant you had $25 million in the bank. And 155,000 shares would have meant you had $7.75 million in the bank. However, let’s look at some more likely scenarios. Citi is currently trading at $3.00. As these options are longer dated (I believe the prices quoted above were for 3 year options), could one see a world where Citi is at $10, $15, or even $20 3 years in the future? I think so. So, 155,000 options would be worth between $1.55 million and $3.1 million.The other option is some combination of cash and restricted stock. As we see above, the total shares one would get, if merely receiving restricted stock (at the current trading level) is approximately half to two-thirds. Now, obviously there are risks. Citi might not be around in three or more years–that is anyone’s guess! This assumes share price increases quite a bit (although the numbers look good even for more modest scenarios). However, all of these would be issues with restricted shares as well–which Wall St. heavily relies upon for compensation. Also, this is just for Citi, which is clearly in a more precarious position than some of it’s peers. For a firm like Goldman, Morgan Stanley, or even Merrill/BofA, the probability of defaulting is way lower. And, for those firms, volatility is lower, making options less valuable, and increasing the ratio of options to restricted shares. the purposes of comparison, Goldman is currently trading at approximately $100 and it’s two year volatility is around 60%. This yields an option price of around $39, or 3x as many options as restricted shares. So, for every $20 Goldman’s shares go up, one would make 3x as much if they had options. You see where I’m going with this? Now, I don’t know the specific rules surrounding a firm’s ability to re-cast their payments once they’ve been made, or how they compute strike prices, restricted share award prices, or other details. But, I would bet that these firms go back to their employees and let them re-think some of their options (no pun intended). Fun Super Irony Fact: HR 1586, in the 110th congress was the “The Death Tax Repeal Act of 2007”!!! Well, we’ve heard a ton about stress tests recently. Want some details on what a stress test entails? The Journal has some details about the tests here. Now, as much as I think GDP and unemployment are fine things to project forward for economists, let’s walk through the way one would use this to actually price an asset. Let’s start with something simple, like a 10-year treasury note (note that treasury bond specifically refers to bonds with a 30-year maturity). Here are all the components one would need to stress test the value of a treasury note. Characteristics of the note itself: coupon, payment dates, maturity dates, etc. What the yield curve would look like at the date you’re pricing the note. Why would one need to know the shape of the yield curve (term structure of rates)? This is important, in order to “PV” the bond’s cashflows most accurately, one would discount each cashflow by it’s risk–the simplest proxy is to discount each cash flow by the rate of interest one would need to pay to issue a bond maturing on that date. For the government, this rate of interest is the point on the treasury yield curve (actually, the par zero curve) with the same maturity date. An example would be, if I were going to price a cash payment I will receive in two years, and the government can currently issue two-year debt at 5%, I should discount my cash payment (also from the government, since it’s a treasury note) at 5%. Treasuries are the simplest of all instruments to value. Now, it is completely and totally guesswork to figure out, given unemployment and GDP figures, what the yield curve will look like at any date in the future. Indeed, one can plug these projections into a model and it can come up with a statistical guess… But the only thing we know for sure about that guess is that it won’t be accurate, although it might be close. However, things like inflation will drive the longer end of the yield curve and monetary policy will drive the shorter end, so these certainly aren’t directly taken from the stress test parameters, but would need to be a guess based on those parameters. This is a large source of uncertainty in pricing even these instruments in the stress test. Next, let’s examine a corporate bond. What would we need for a corporate bond? Characteristics of the bond: coupon, payment dates, maturity dates, special features (coupon steps, sinking funds, call schedules, etc. ), where in the capital structure this bond sits, etc. What the yield curve would look like at the date you’re pricing the bond. The spreads that the corporation’s debt will carry at the date you’re pricing the bond. Oh no. We already saw the issues with #2, but now we have #3. What will this corporations credit spread (interest/yield required in excess of the risk free rate) at the time of pricing? Will the corporations debt, which could trade at a spread of anywhere from 5 to 1500 basis points, be lower? higher? Will the corporations spread curve be flatter? steeper? There, the spread is the difference between the purple line and the black line. As you can see, it’s different for different maturity corporate bonds (which makes sense, because if a company defaults in year two, it’ll also default on it’s three year debt.. but the companies’ two year debt might never default, but the company might default during it’s third year, creating more risk for three year bonds issued by that company than two year bonds). It shouldn’t be a surprise, after our exercise above, to learn that the best way to compute the price of a corporate bond is to discount each cashflow by it’s risk (in my example above, regardless of whether the company defaults in year two or year three, the interest payments from both the three year and two year debt that are paid in one year have the same risk). Well, how does one predict the structure of credit spreads in the future? Here’s a hint: models. Interest rates, however, are an input to this model, since the cost of a firm’s borrowing is an important input to figuring out a corporation’s cashflow and, by extension, creditworthiness. So now we have not only a flawed interest rate projection, but we have a projection of corporate risk that, in addition to being flawed itself, takes our other flawed projections as an input! Understanding model error yet? Oh, and yes unemployment and the health of the economy will be inputs to the model that spits out our guess for credit spreads in the future as well. Next stop on the crazy train, mortgage products! What does one need to project prices for mortgage products? Characteristics of the bond: coupon, payment dates, maturity dates, structure of the underlying securitization (how does cash get assigned in the event of a default, prepayment, etc. ), etc. The spreads that the debt will carry at the date you’re pricing the bond. What prepayments will have occurred by the date you’re pricing the bond and what prepayments will occur in the future, including when each will occur. What defaults will have occurred by the date you’re pricing the bond and what defaults will occur in the future, including when each will occur. Oh crap. We’ve covered #1-3. But, look at #4 and #5 … To price a mortgage bond, one needs to be able to project out, over the life of the bond, prepayments and defaults. Each is driven bydifferent variables and each happens in different timeframes. Guess how each projection is arrived at? Models! What are the inputs to these models? Well, interest rates (ones ability to refinance depends on where rates are at the time) over a long period of time (keep in mind that you need rates over time, having rates at 5% in three years is completely different if rates where 1% or 15% for the three years before). General economic health, including regional (or more local) unemployment rates (if the south has a spike in unemployment, but the rest of the country sees a slight decrease, you’ll likely see defaults increase). And a myrid of other variables can be tossed in for good measure. So now we have two more models, driven by our flawed interest rate projections, flawed credit projections (ones ability to refinance is driven by their mortgage rate, which is some benchmark interest rate [treasuries here] plus some spread, from #3), and the unemployment and GDP projections. I will, at this point, decline to talk about pricing C.D.O.’s … Just understand, however, that C.D.O.’s are portfolios of corporate and mortgage bonds, so they are a full extra order of magnitude more complex. Is it clear, now, why these stress tests, as they seem to be defined, aren’t all that specific, and potentially not all that useful?